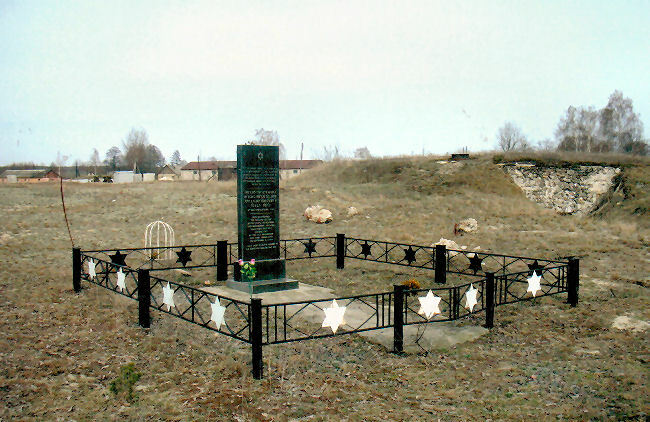 "In memory of the thousands of martyrs of Borszczcow, Skala, Ozirn, Korolivka, Mielnica, Krivec, and the surrounding villages, who, in the spring of 5703, were murdered by the German Nazis and their helpers--may their name and memory be blotted out--and who were buried in a mass grave in this field, which was formerly a ruined cemetery. May God avenge their pure blood. May their souls be bound in the bond of life." Erected in the year 5751 by the survivors of the aforementioned communities. 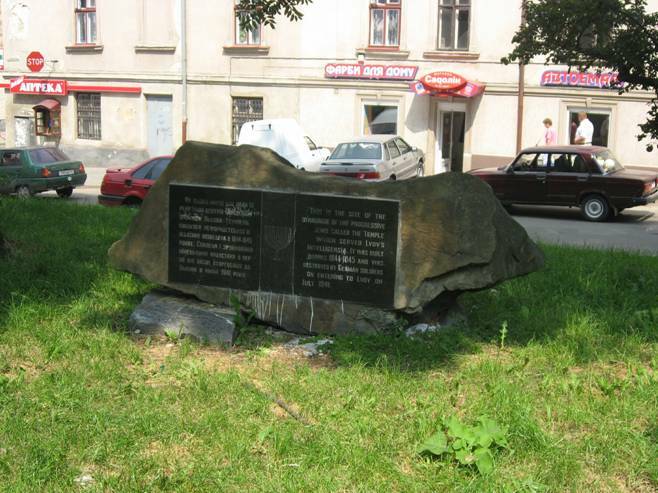 The ghetto of Borszczow was created on April 1st, 1942. It enclosed a number of overpopulated streets with rundown houses. 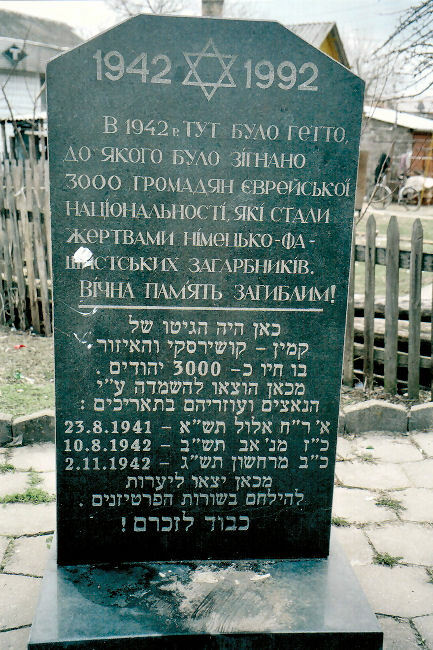 In time, it had to absorb also Jews from Mielnica, Skala, Ozeryany, Korolevka and Krzywcze Gorne as well as Jews from Zloczow and Czortkow. 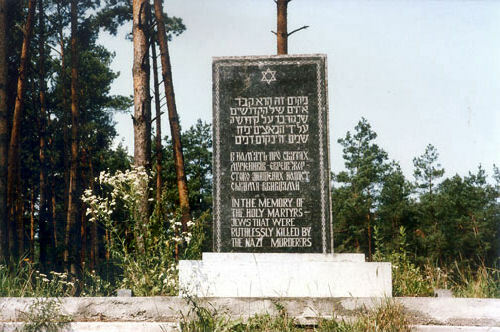 "In the memory of the Holy Martyrs -- Jews that were ruthlessly killed by the Nazi murderers." 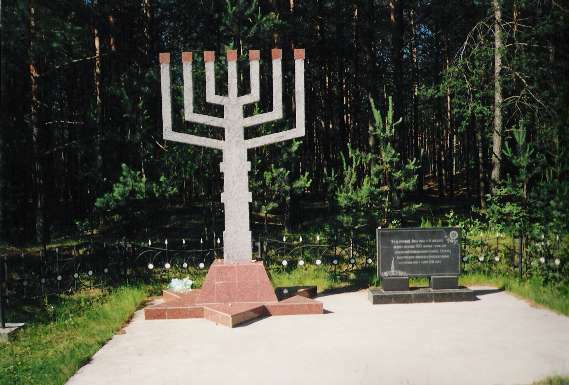 This is one of the memorials erected by Jewish survivors of Dubno. 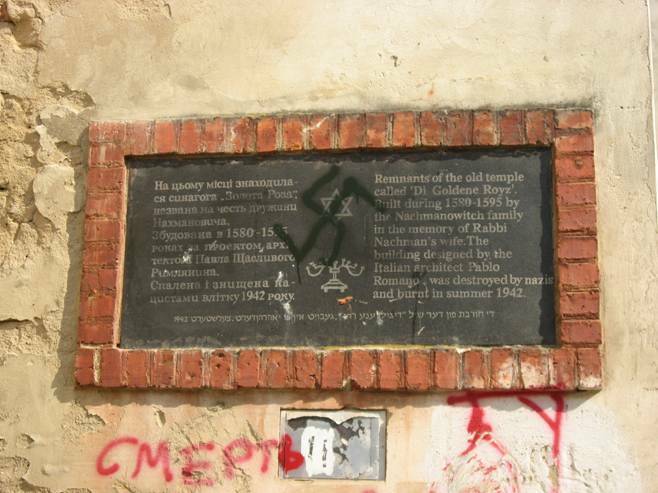 This, like the others, has had plaques of explanatory text removed by vandals. 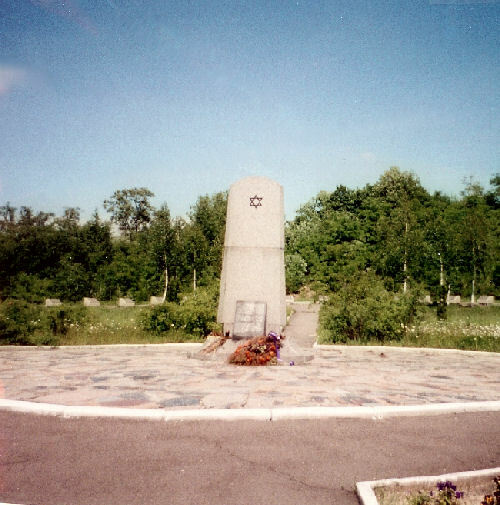 One of three memorial sites where Jews were killed en masse during WWII. 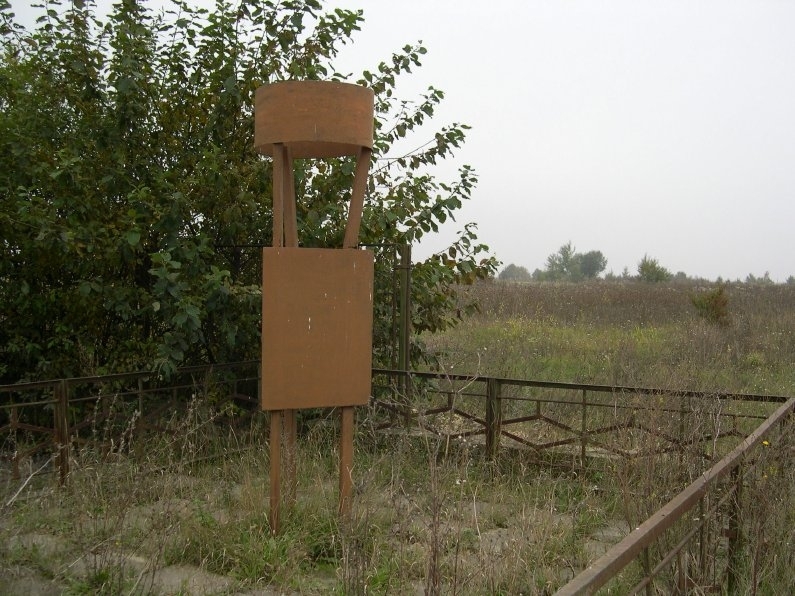 This location is near the former airstrip, just outside of town. 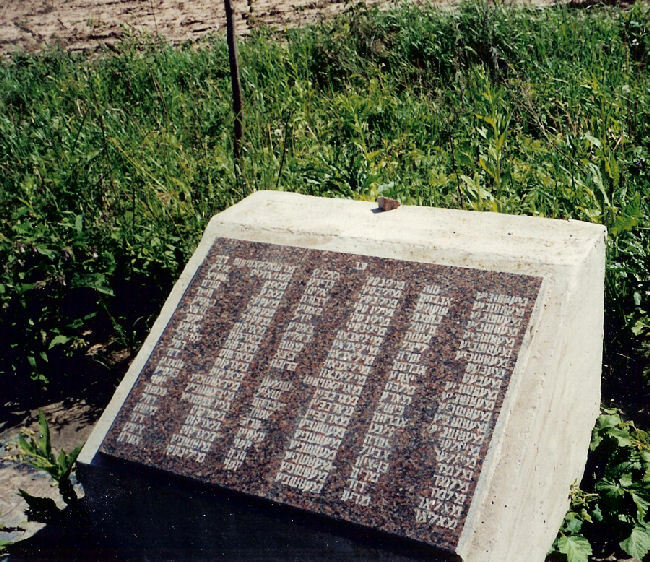 Information plaques removed by vandals. 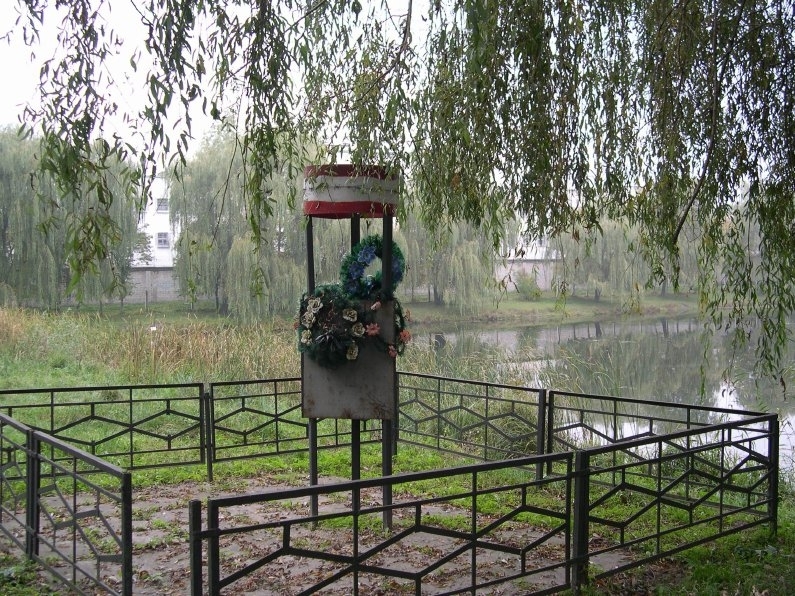 This site overlooks the Ikva River. Plastic floral wreaths. 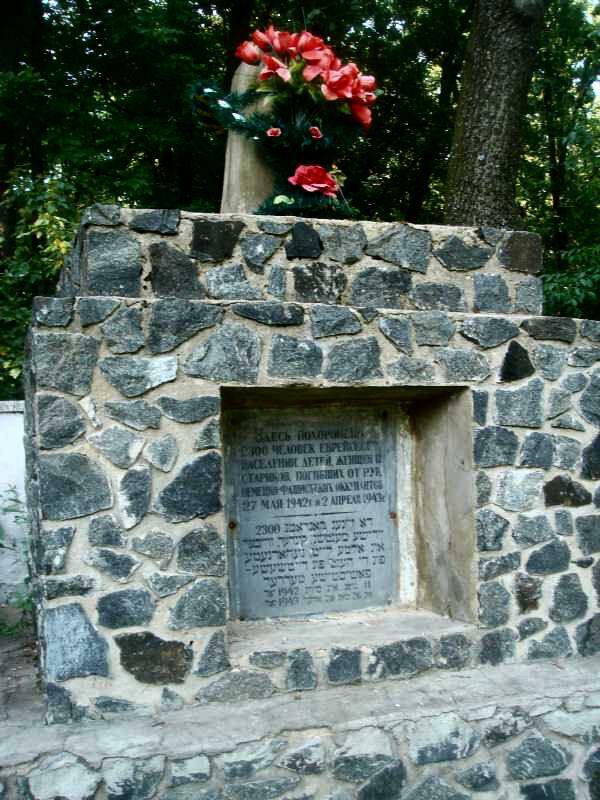 Left: Memorial at the killing field outside of town. May their souls be bound in the knot of life." 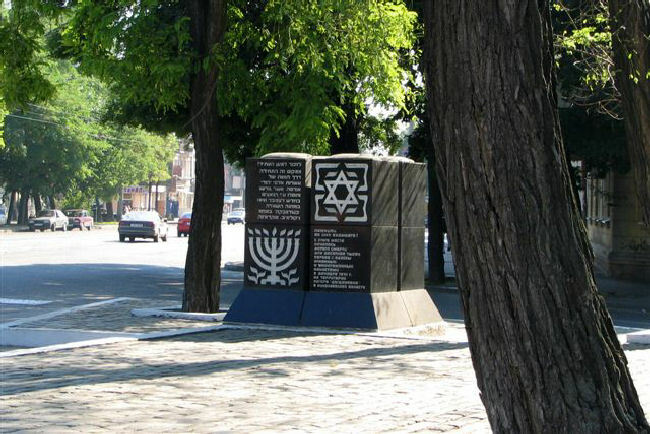 Memorial marks the site of the former ghetto. 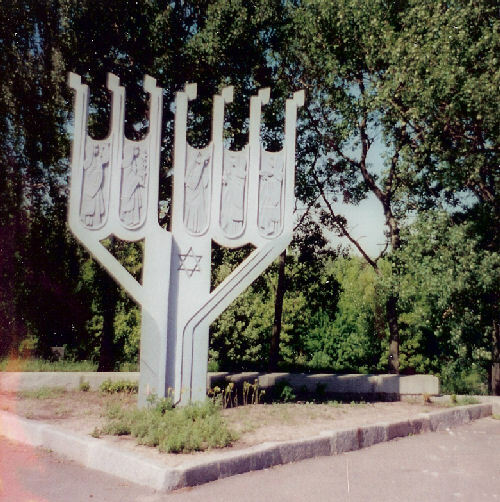 From here Jews left for the forests to fight in the ranks of the partisans. 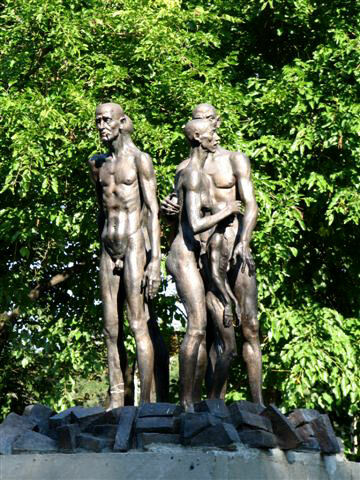 Honor to their memory!" 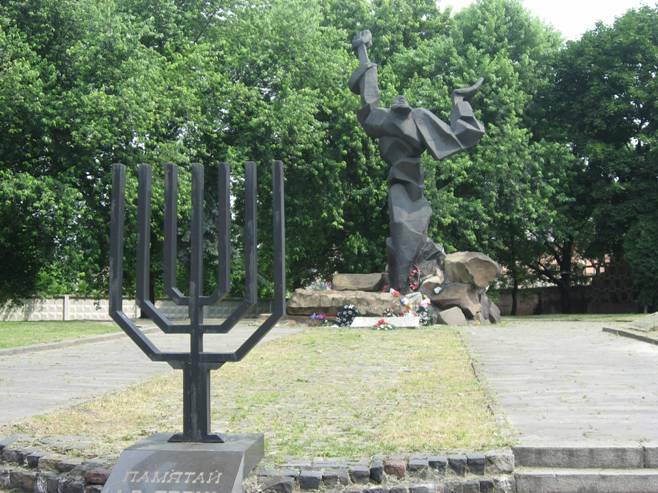 "Let the Memory of All the Nazi Genocide Victims in Janowska Death Camp Remain Forever. 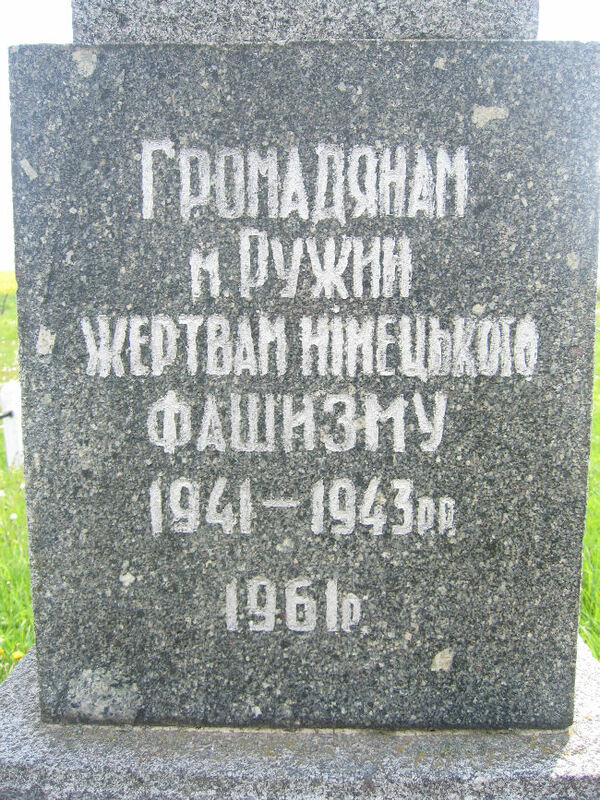 1941-1943." 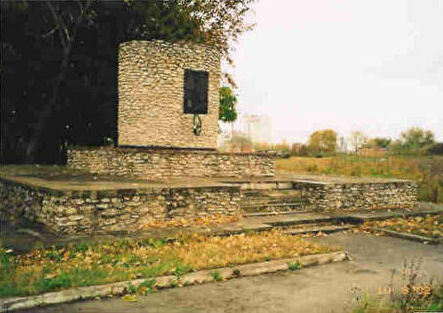 This monument stands in a park near a stadium, on an elevated area surrounded by grass-covered ravines. 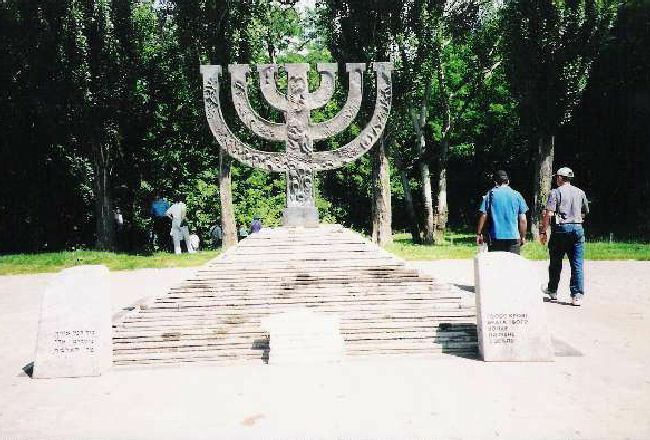 Babi Yar means 'Women’s Ravine'. Baba (common parlance, low colloquial) means a peasant woman, a simple woman, also a wife (peasant language, also vulgar). There were there seven ravines. 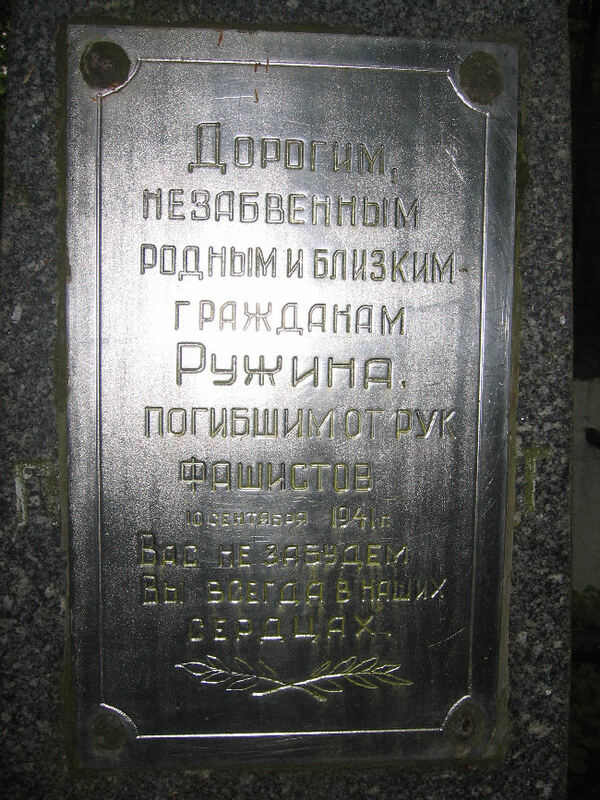 There are three plaques here, one each written in Russian, Ukrainian and Hebrew. 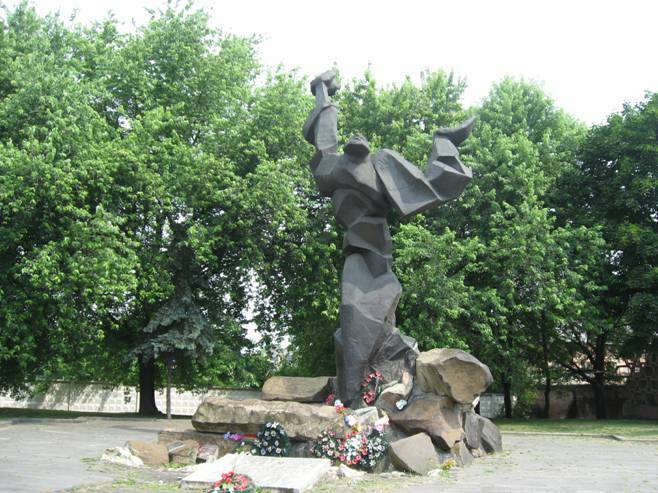 the German Fascist invaders shot more than one hundred thousand Kiev citizens and military captives." "And I shall put my spirit in you and you shall live." 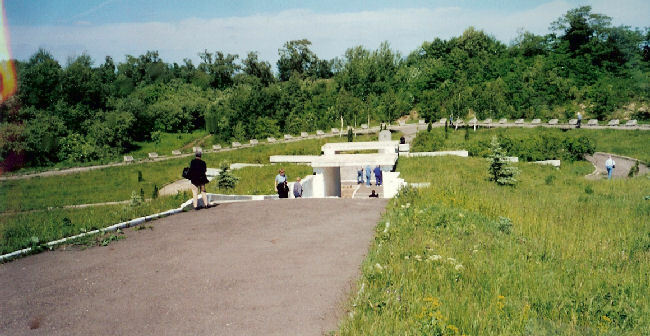 the slaughter of Babi Yar. 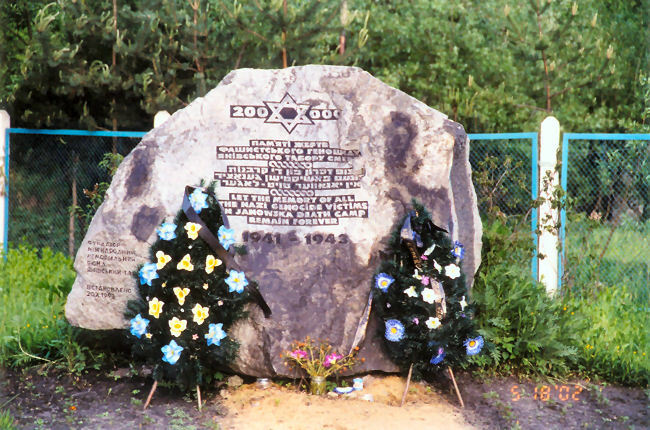 13 Tishrei 2002"
"To the children shot in Baby Yar 1941." 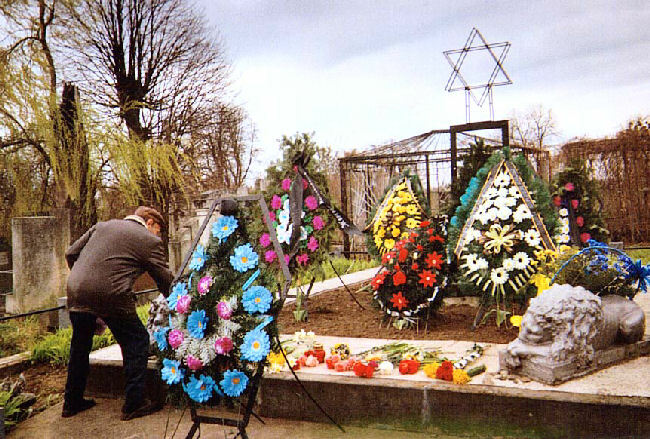 "...mourns the loss of the tens of thousands who were murdered at Babi Yar...of Israel be comforted among the ... mourners of Zion & Jerusalem." 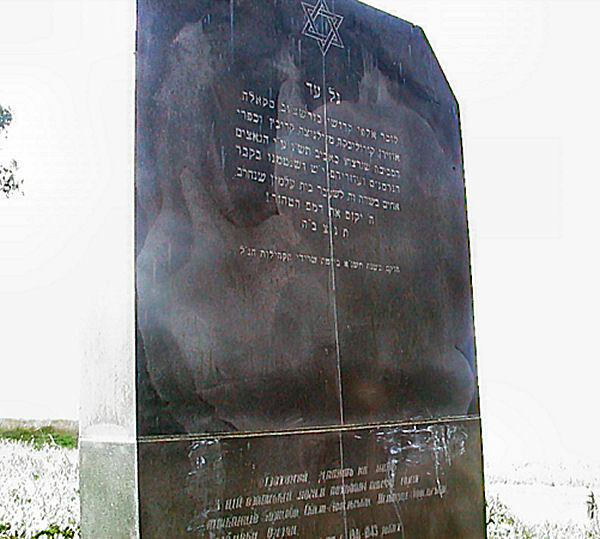 Located at the base of the menorah memorial, dated 22.01.2001 with the name of Moshe Katzav inscribed upon it. 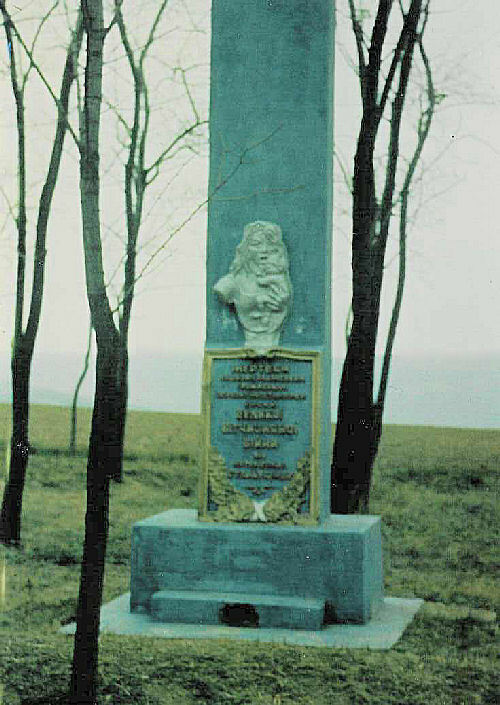 The memorial is located about five miles outside of town. 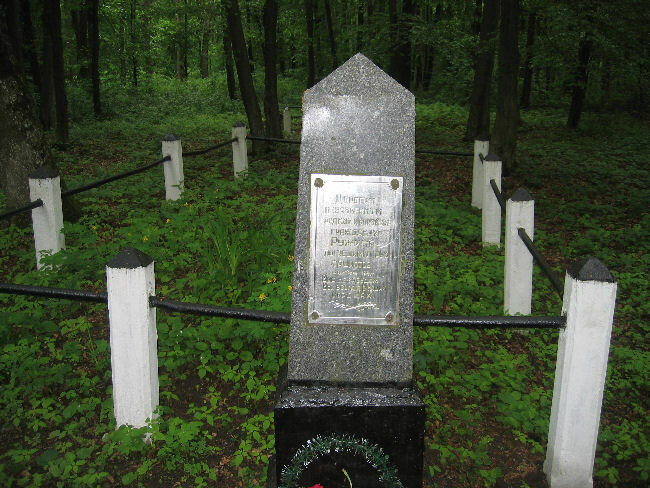 Although it is in the woods near a major two-lane highway, there is no marker to indicate it is there, other than some tire tracks leading into the woods. 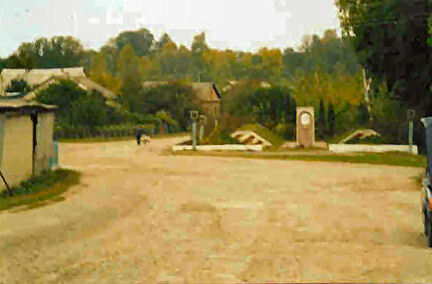 It is a dirt road that leads up to the memorial. 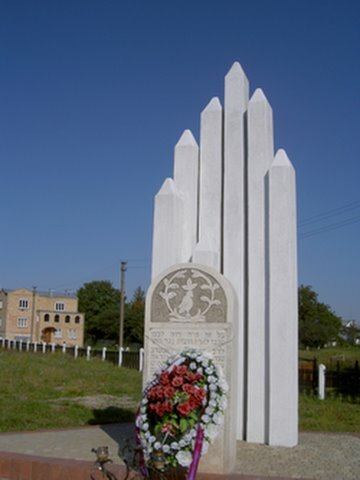 It commemorates those who were taken from Kovel to be killed in this place. 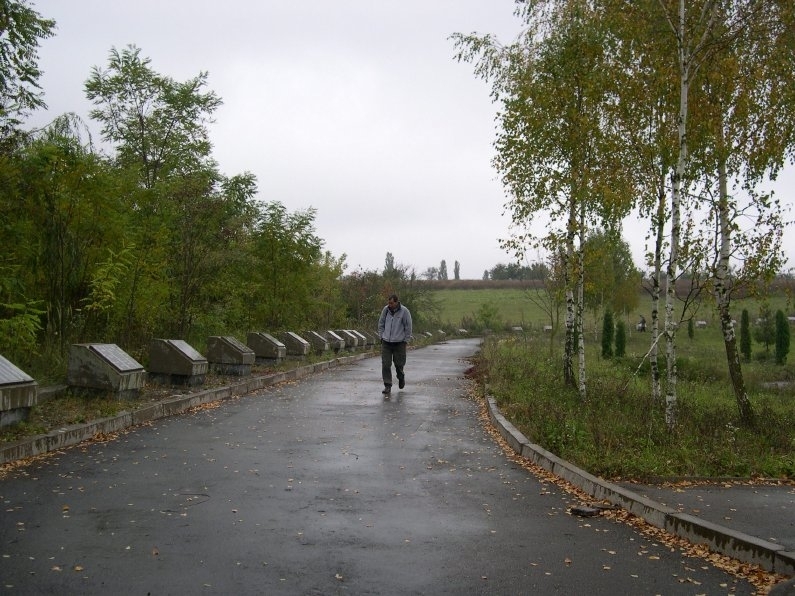 the way to Kovel from L'viv. New mass grave memorial completed a few years ago right in town. 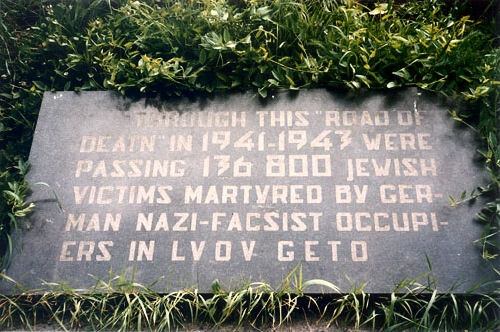 Memorial plaque in remembrance of those killed here. 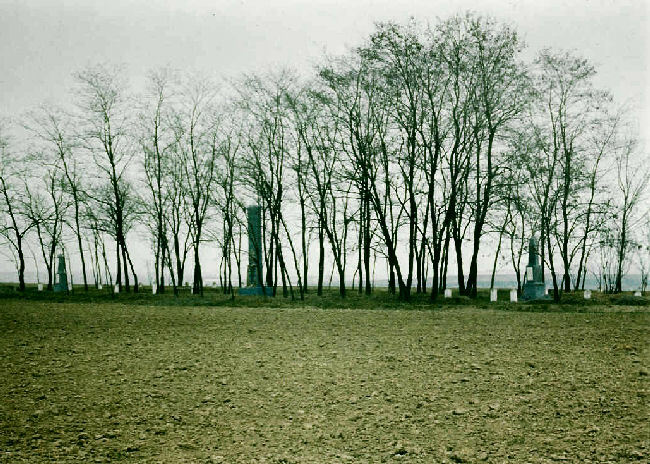 "Here are buried the Soviet citizens who were bestially tortured and shot by the German-fascist occupants 1941- 1945." 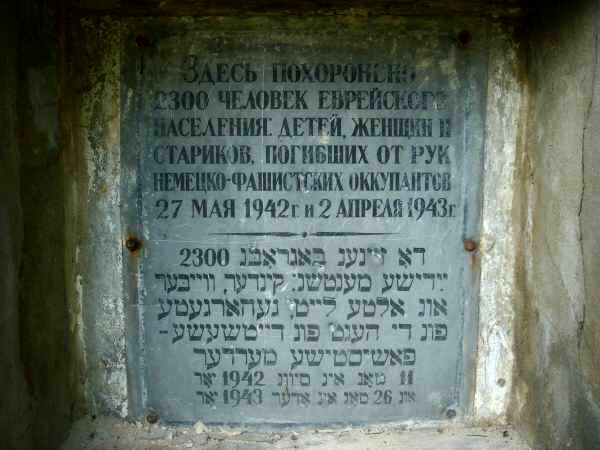 According to the translator, Dr. Joseph Ash in Israel: "It was the usual inscription in the Soviet Union. 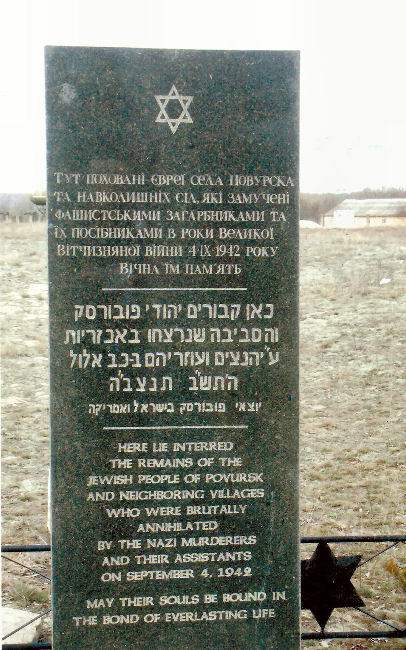 They never mentioned that the 'citizens' were mostly Jews." 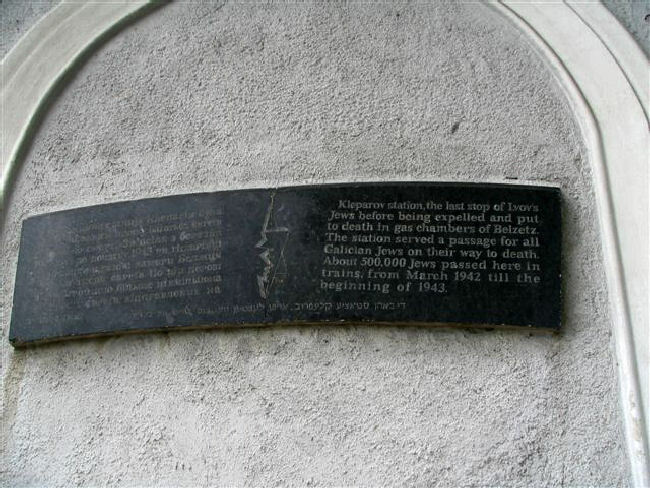 The dates on the monument are misleading, possibly deliberately so. 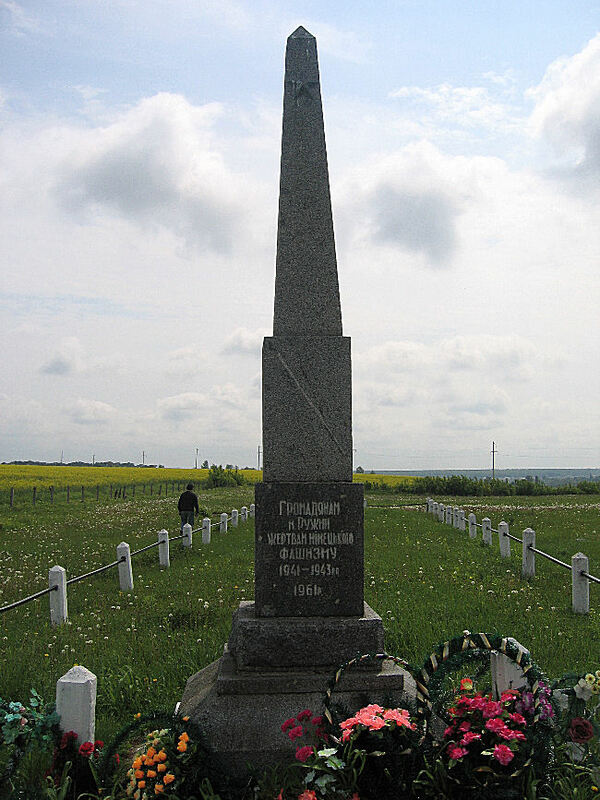 In stating that the deaths took place from 1941-1945, the monument seems to suggest that these anonymous "Soviet citizens" were the usual run of war casualties. 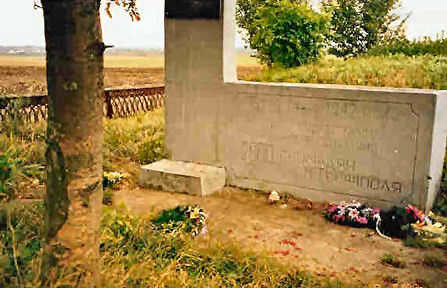 The Nazi Einsatzgruppen who killed the Jews in this area finished their work in 1941. 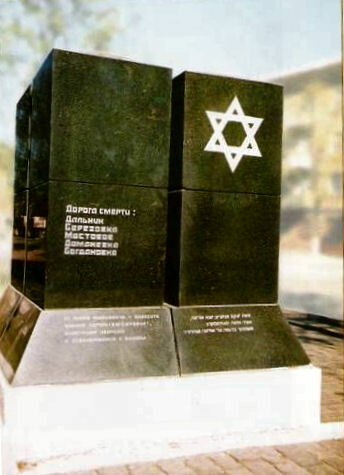 In 1942, with most of the Jews in the USSR already killed, the Nazis turned to gas chambers to save precious bullets on the Jews in central and western Europe. 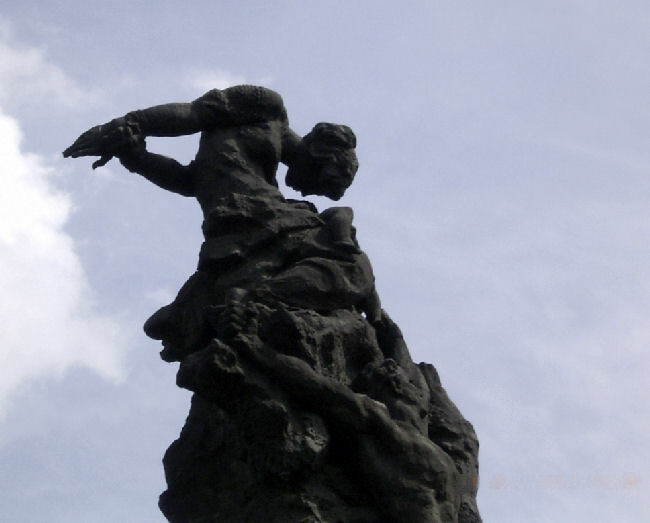 to the victims of the Nazis." 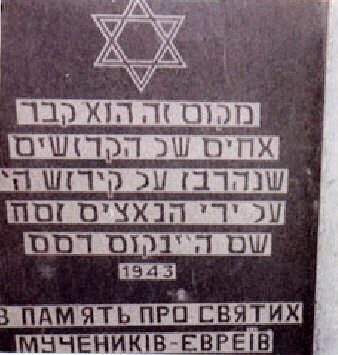 A plaque commemorating the Rose Synagogue of L'viv. 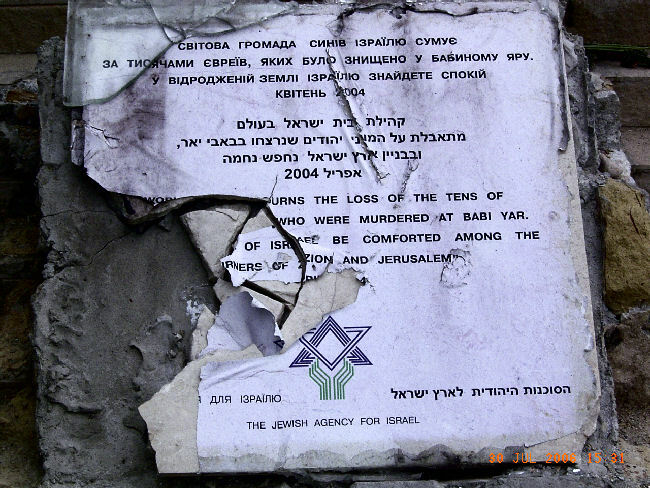 Unfortunately, as you can see, anti-Semitism is alive in Ukraine. 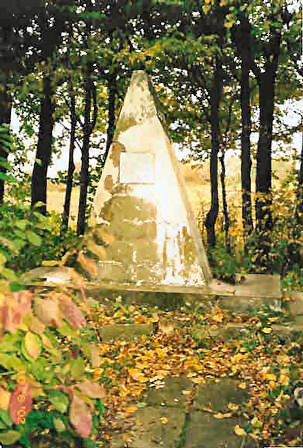 "Remnant of the old temple called 'Di Goldene Royz'. 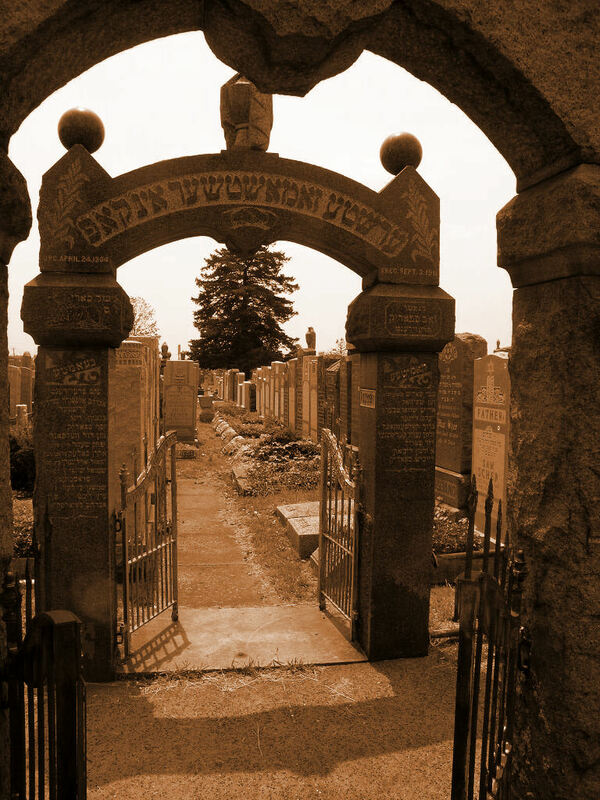 Built during 1580-1595 by the Nachmanowitch family in the memory of Rabbi Nachman's wife. The building...was destroyed by Nazis and burnt in summer 1942." 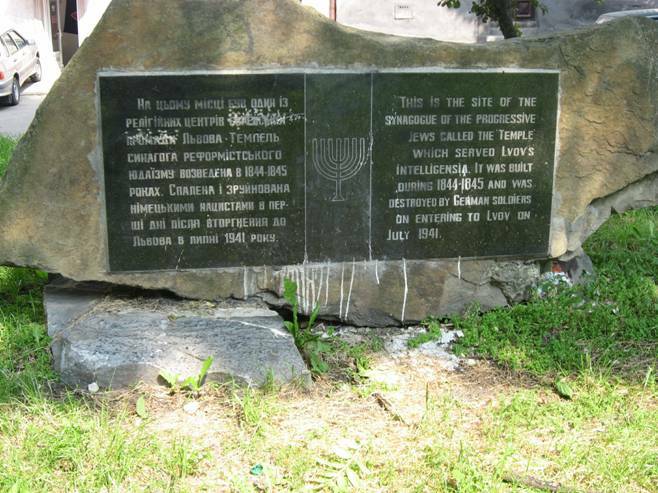 "This is the site of the synagogue of the Progressive Jews called "The Temple" which served Lvov's Intelligensia. 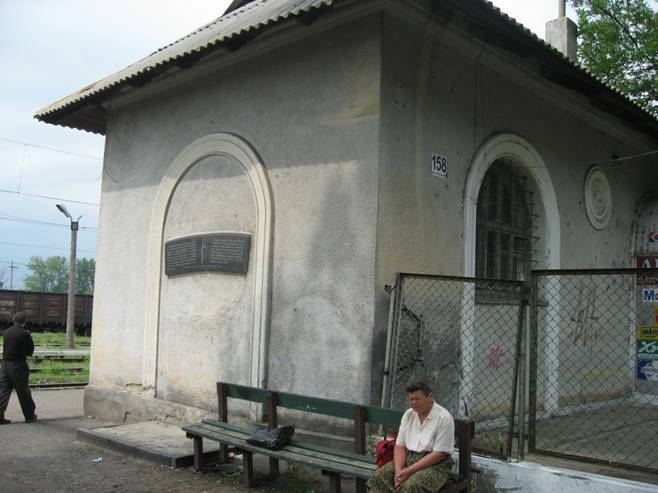 It was built during 1844-1845 and was destroyed by German soldiers on entering to Lvov on July 1941." 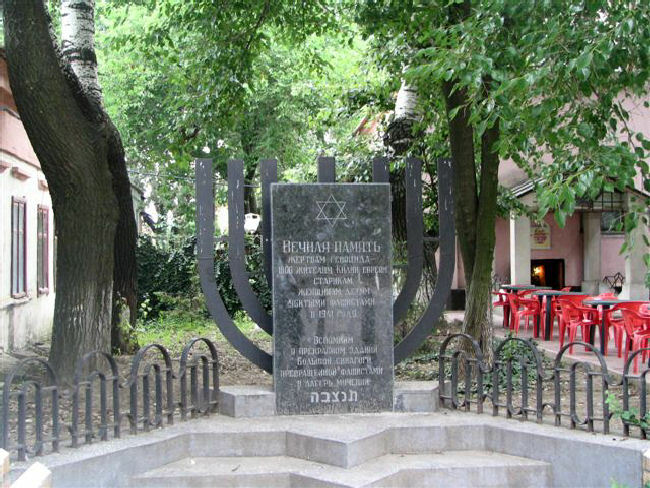 The synagogue memorial is located in a small park in town. 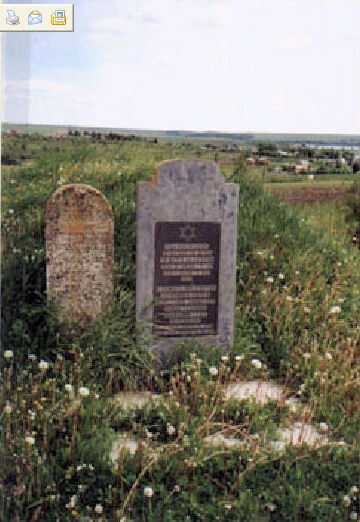 The site of a synagogue destroyed by the Nazis, located at the southern edge of town. 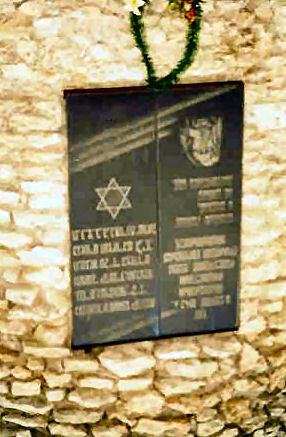 Memorial plaques at the ghetto memorial site. 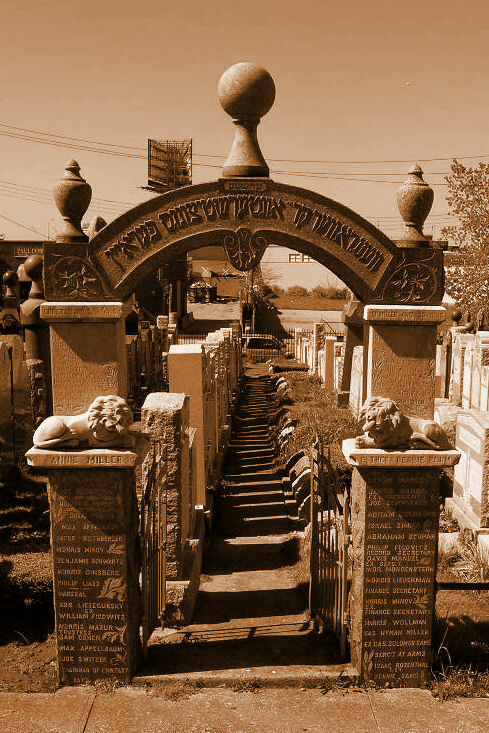 "In memory of the families ?omberger and Tennenbaum." 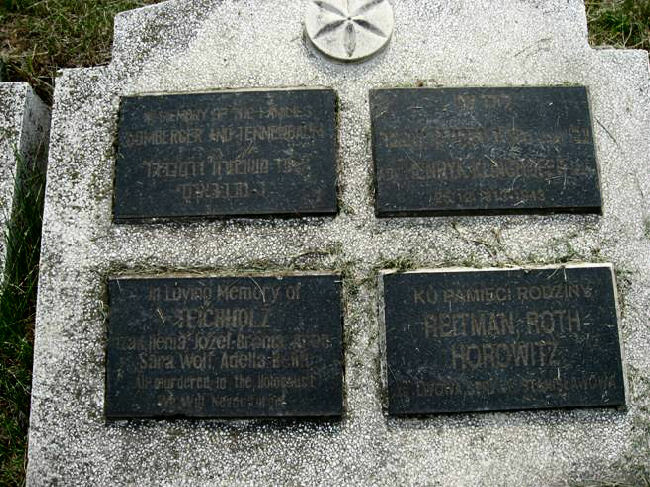 Also, "In loving memory of Teichholz...all murdered in the Holocaust during WWII." 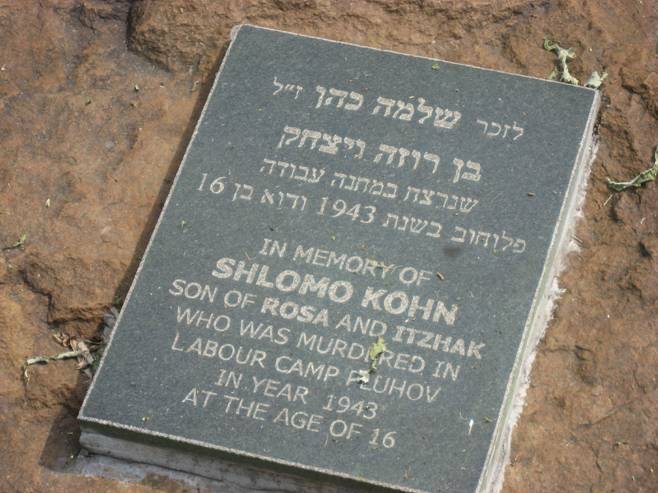 "In memory of Shlomo Kohn, son of Rosa and Itzhak who was murdered in labor camp Pluhov in the year 1943 at the age of 16." 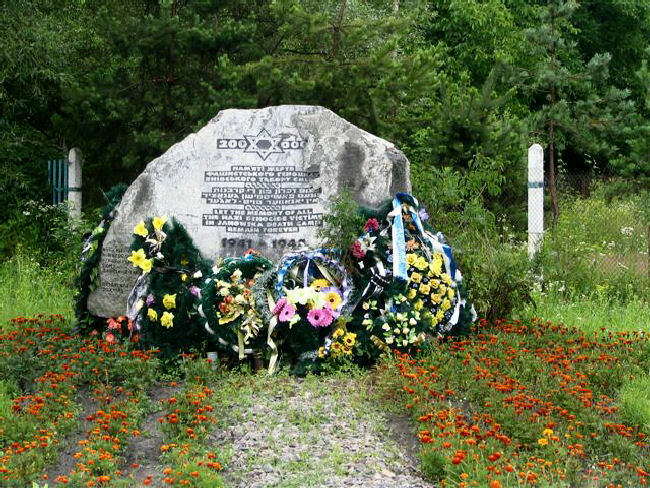 "Let the memory of all the Nazi genocide victims in Janowska death camp remain forever...1941-1943." 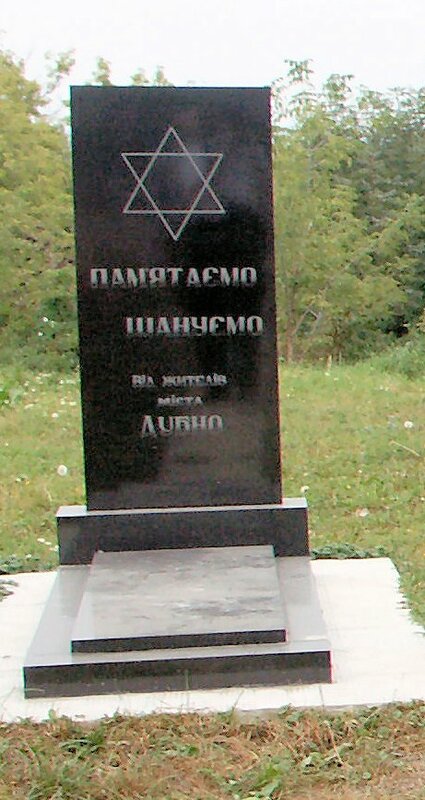 Monument on the place of slaughter of Pavoloch Jews during World War II. 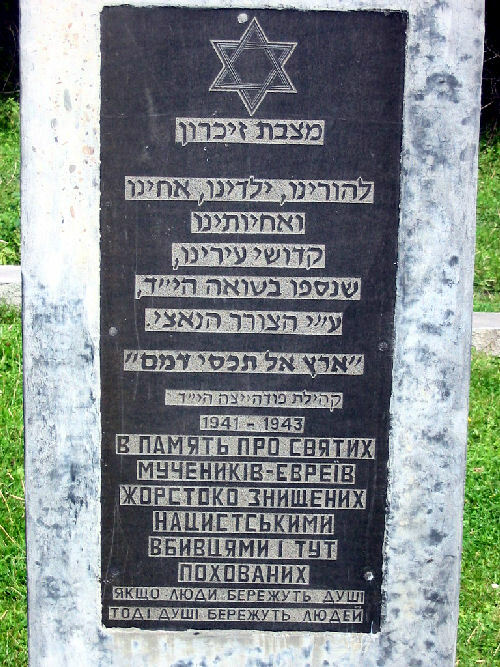 The inscription in Russian and Yiddish reads: Victims of the Hitler's terror in 1941, all Jewish population of Pavoloch, are resting here. We, your friends always pray [for you] and shed bitter tears. 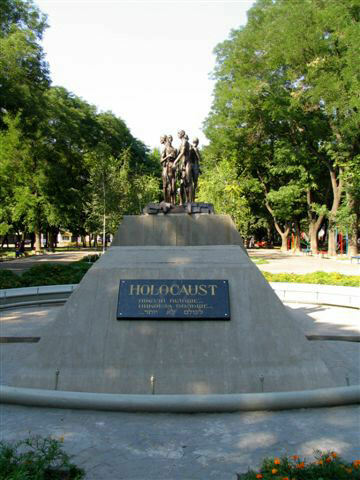 who were exterminated in the Holocaust by the Nazi oppressor. Earth! Do not cover their blood." 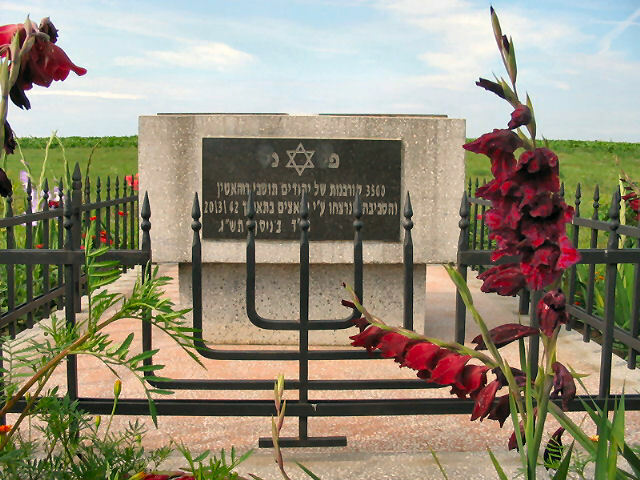 May the Almighty Avenge its Blood 1941-1943.
murderers and buried at this place. When people take care of the souls, then souls will take care of the people." 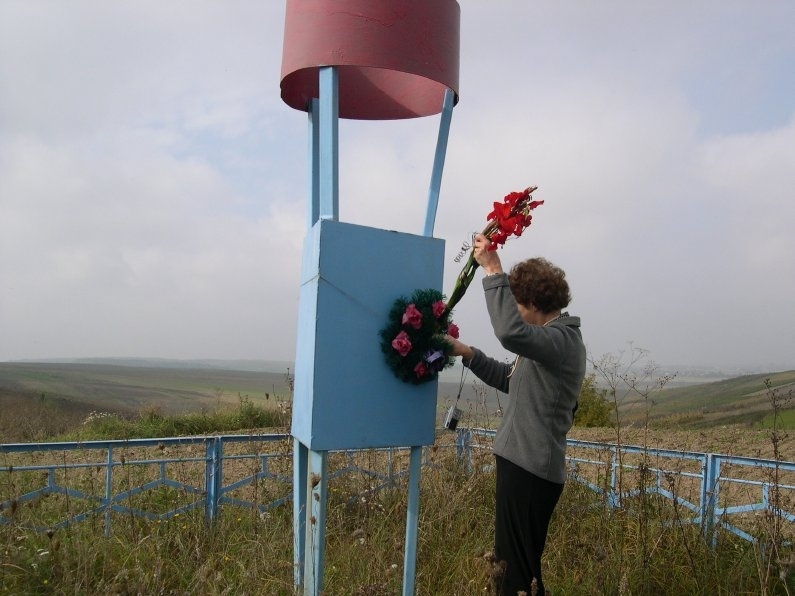 This memorial is located on a hill top at the site of the mass grave outside of the town.
" 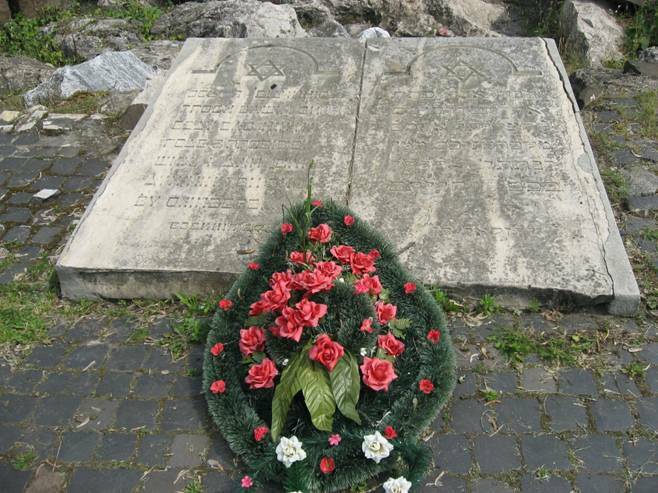 This place is a mass grave of the martyrs that were killed for the sanctity of God by the Nazis, may their name be forever blotted out. G-d shall avenge their blood." 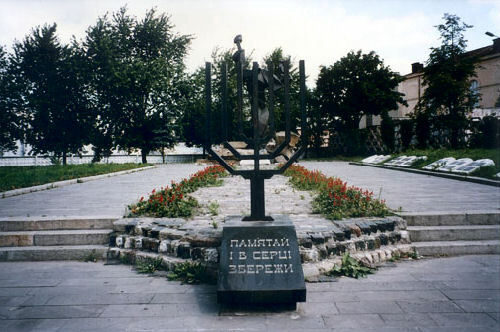 The inscription reads: "Here lie interred the remains of the Jewish people of Povursk and neighboring villages who were brutally annihilated by the Nazi murderers and their assistants on September 4, 1942. May their souls be bound in the bond of everlasting life." 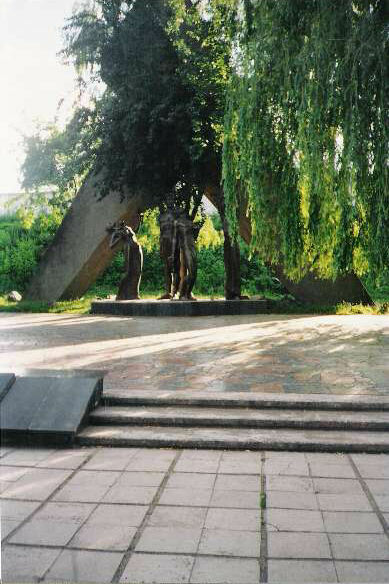 The "Victims of Fascism" monument. 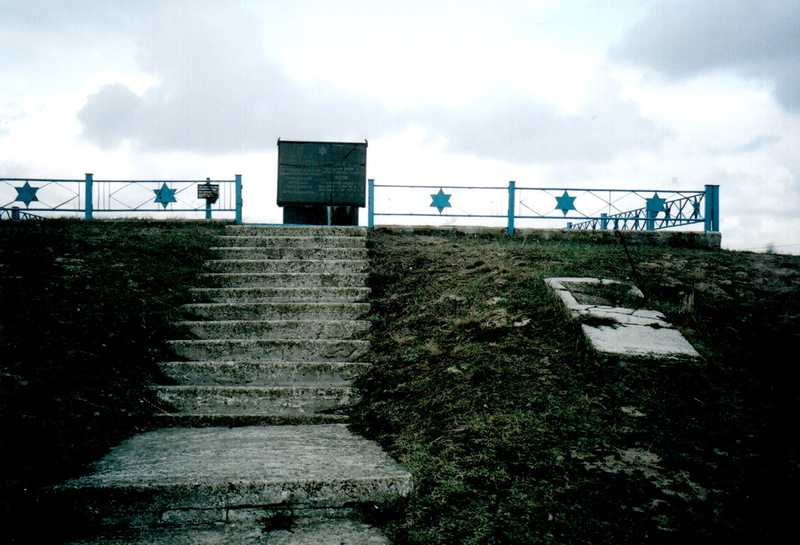 At the top of a small rise is a huge area whose boundaries are marked by tablets listing names of those murdered. 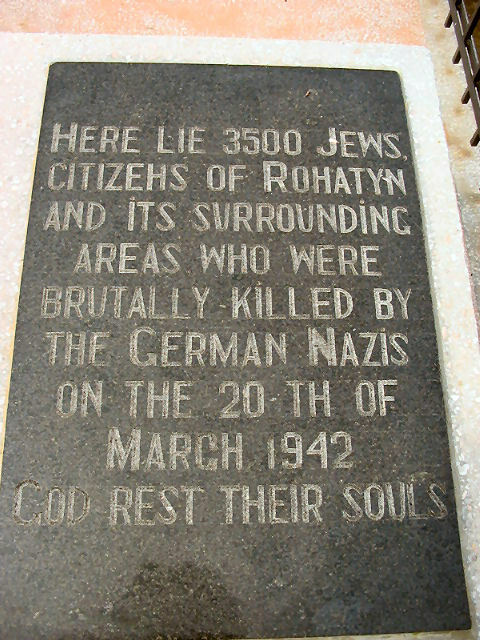 "Here lie 3500 Jews, citizens of Rohatyn and its surrounding areas who were brutally killed by the German Nazis on the 20th of March 1942. 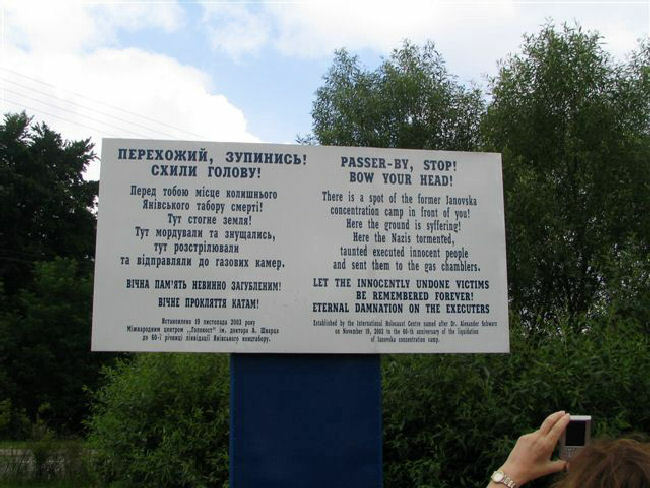 "To the citizens of the town of Ruzhin, victims of German Fascists"
This is a group of monuments with identical plaques - over mass graves, in the forest outside of Ruzhin. 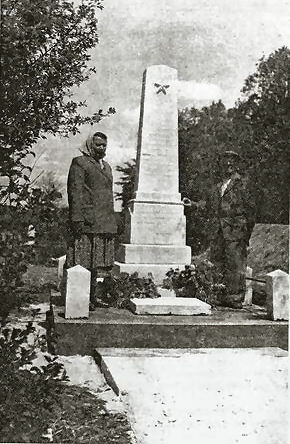 It is believed that women and children were shot and are buried in separate graves from those of the men. 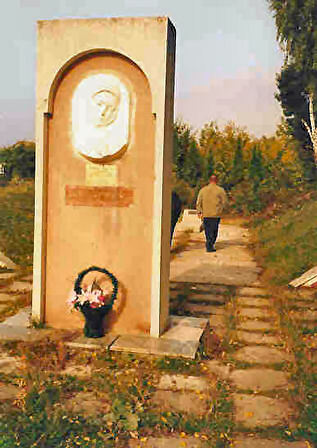 Ruzhin killed by Fascists on September 10th 1941. Never to be forgotten, you will always live in our hearts." 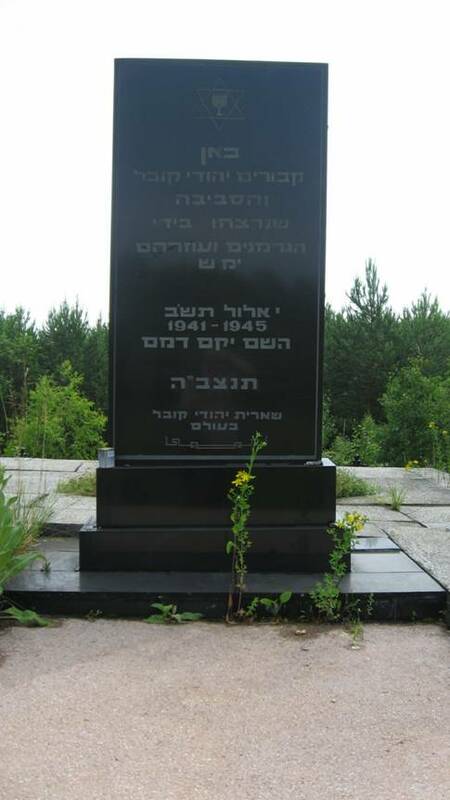 "Here in this forest, Lysa Hill, in six graves [mass graves] are buried the remnants of eight-hundred peaceful citizens of Jewish nationality of the town of Slavuta who were murdered by the German Fascist invaders in July 1941." 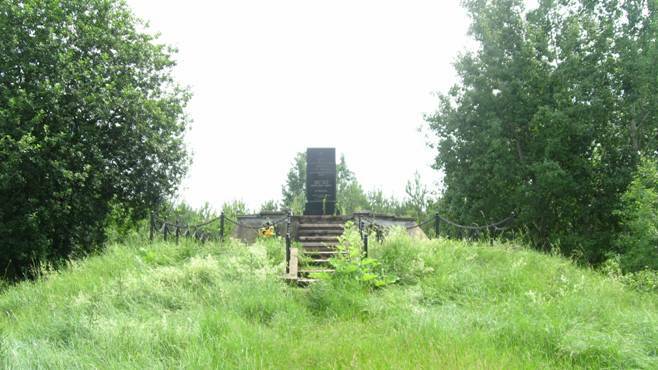 This monument was erected jointly by the Ukrainian government and the survivors of Slavuta. 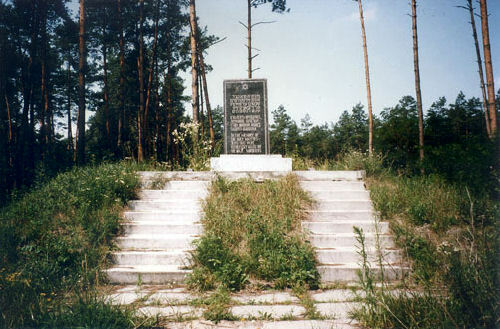 This is the site where over one-thousand Jews from Staraya Ushitsa and Studenitsa were executed by Nazis on July 23, 1943. 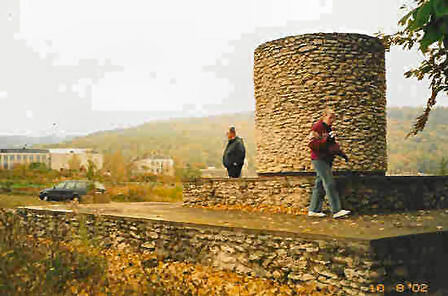 It is located on a hill one kilometer form the old shtetle and forty-three kilometers from Kamenets-Podolsky. 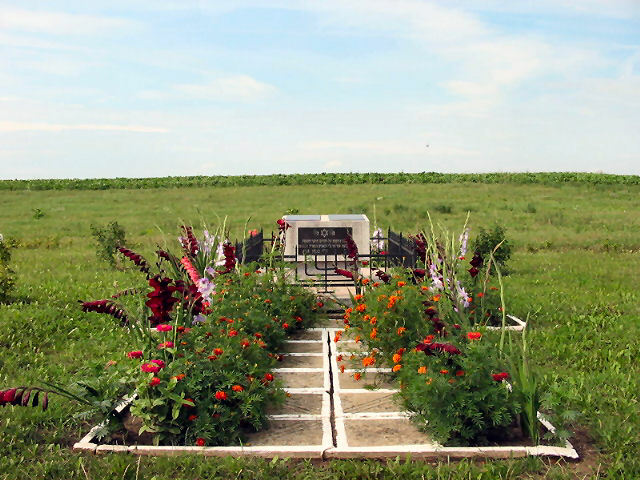 There is also a mass grave--a long, long row of a small heap of dirt surrounded by a white fence. 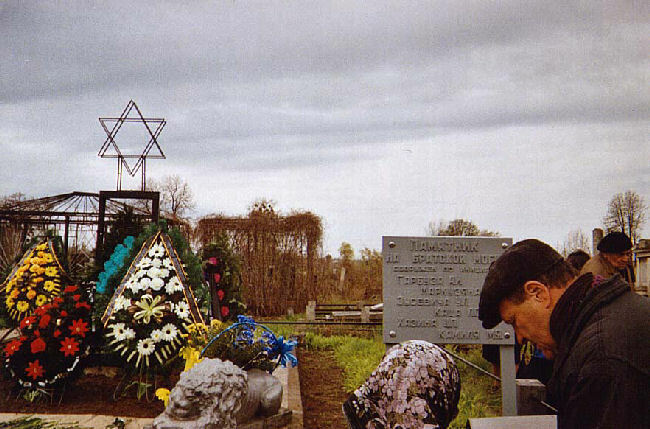 At the end of the fence is a monument to the five-thousand Jews buried in the grave. 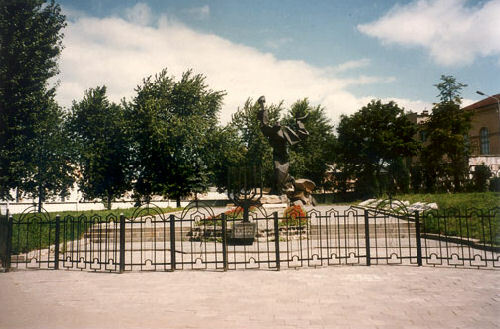 This was also erected by the city together with the survivors. 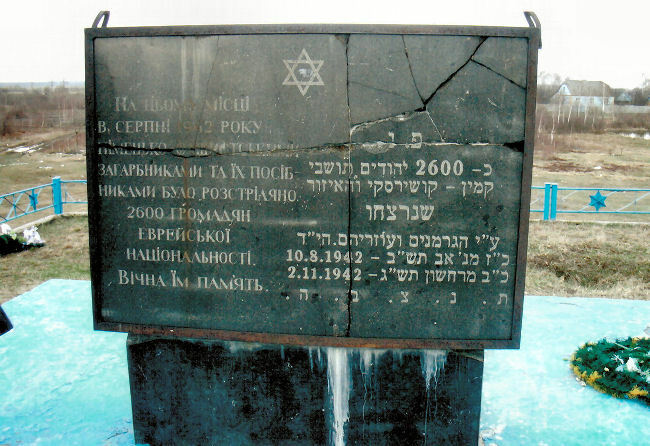 At one time there were twenty-thousand Jews who lived in the Starakostyantyniv County with five Jewish schools. 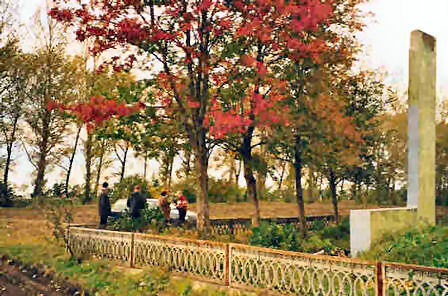 At present there is a community of one-hundred in the town. three miles outside of town. 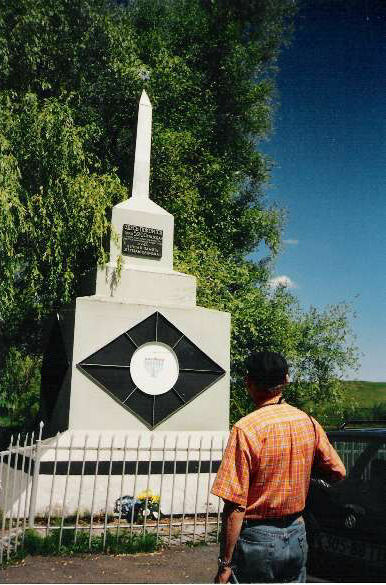 about 200 miles south of Kiev. hands of the Germans-Fascists May 27, 1942 and April 2, 1943." 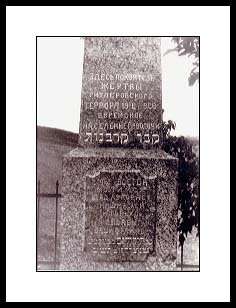 "In the memory of the holy martyred Jews of Zolochiv that were ruthlessly killed by the Nazi murderers during 1941-1945." 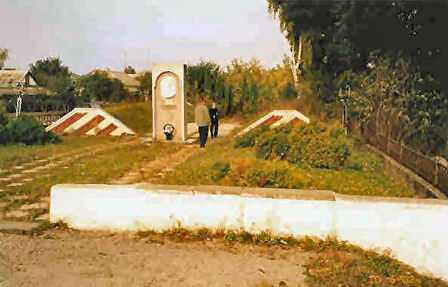 The memorial was dedicated in early Sep 2006.